Gardens add a sense of permanence to a home, giving it a sense of style that reflects the preferences of the owners. Learning how to design a backyard garden doesn't require the services of a skilled professional. This simple do-it-yourself project can be accomplished by anyone with the proper tools and time. Designing a backyard garden requires some planning—to make sure your exterior decorative addition lasts for many years to come. Let's look at how to design a backyard garden. Determine the functionality of your backyard garden. To make this decision, look at where you'd like to place the garden. Some gardens frame an existing deck, patio, or walkway while others simply stand alone to create a dramatic focal point in a yard. Assess the amount of sunlight in your chosen location. Document the exact hours of sunlight in the proposed garden plot. This evaluation will help you choose plants that will thrive in this location. Plot out the garden area with a long piece of string or garden hose. Lay out the perimeter of your garden to help you visualize how it will work in your chosen location. Using a hose or string allows you to adjust the size and shape until you reach a design that pleases you. Measure the general length and width of the garden. These measurements will help you determine the number of plants, mulch, border, or gravel you need to place in and around your garden. Draw the major features of your property on the graph paper. Include landscaping features such as decks, porches, walkways, patios, and retaining walls. Add the garden onto the graph paper. This scale drawing doesn't need to be perfect, but it will allow you to really visualize how your garden will look. Choose plants that complement your existing landscape as well as those native plants. Native plants tolerate your particular climate conditions the best to allow for a full growing season and thriving plants that last many years. Local garden centers can help with these decisions. If you prefer, investigate the plants for sale at the nursery and examine the tags in each pot. These labels include water and sunlight requirements as well as growing and blooming times. Remember some basic principles of landscape design. Taller plants should be in the rear of your garden, and height should descend to the front border. Choose two to three plants in a color scheme to create unity and simplicity in the garden. 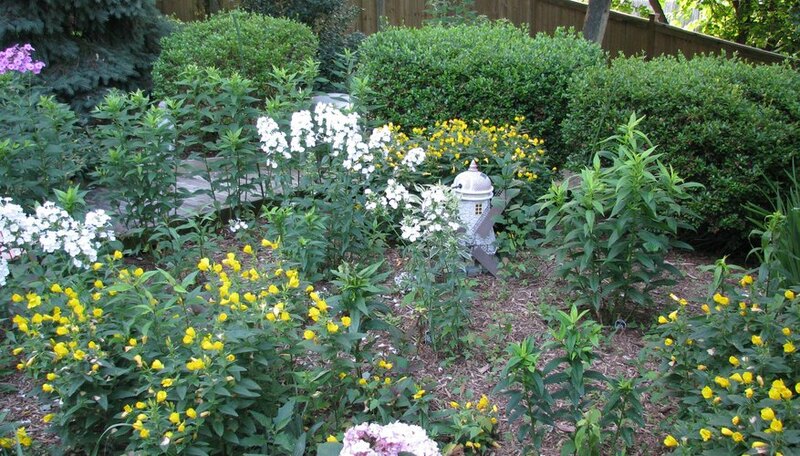 Also consider adding plants that occur in other parts of your yard to tie the new garden into your whole landscape.